GetAbraham Lincoln, one of the great leaders in American history and a self-taught Illinois lawyer and legislator was born on the 12th of February 1809 and died on the 15th of April 1865. Abraham Lincoln led United State during the American Civil War while he was the 16th President of the United State. After his death, he became a legend and a folk hero. Below are some famous quotes that were quoted by Abraham Lincoln during his lifetime. Don’t forget to share these quotes with friends and dear ones because they like it. "If I were to try to read, much less answer, all the attacks made on me, this shop might as well be closed for any other business. I do the very best I know how - the very best I can; and I mean to keep doing so until the end. If the end brings me out all right, what's said against me won't amount to anything. If the end brings me out wrong, ten angels swearing I was right would make no difference." The Inner Life of Abraham Lincoln: Six Months at the White House by Francis B. Carpenter (Lincoln, Nebraska, University of Nebraska Press, 1995), pp. 258-259. "Those who deny freedom to others, deserve it not for themselves; and, under a just God, can not long retain it." The Collected Works of Abraham Lincoln edited by Roy P. Basler, Volume III, "Letter To Henry L. Pierce and Others" (April 6, 1859), p. 376. "As I would not be a slave, so I would not be a master. This expresses my idea of democracy. Whatever differs from this, to the extent of the difference, is no democracy." The Collected Works of Abraham Lincoln edited by Roy P. Basler, Volume II, (August 1, 1858? ), p. 532. "Let us have faith that right makes might, and in that faith, let us, to the end, dare to do our duty as we understand it." Lincoln's Cooper Institute Address, February 27, 1860. "I leave you, hoping that the lamp of liberty will burn in your bosoms until there shall no longer be a doubt that all men are created free and equal." The Collected Works of Abraham Lincoln edited by Roy P. Basler, Volume II, "Speech at Chicago, Illinois" (July 10, 1858), p. 502. "My paramount object in this struggle is to save the Union, and is not either to save or to destroy slavery. If I could save the Union without freeing any slave I would do it, and if I could save it by freeing all the slaves I would do it; and if I could save it by freeing some and leaving others alone I would also do that. What I do about slavery, and the colored race, I do because I believe it helps to save the Union; and what I forbear, I forbear because I do not believe it would help to save the Union. I shall do less whenever I shall believe what I am doing hurts the cause, and I shall do more whenever I shall believe doing more will help the cause." The Collected Works of Abraham Lincoln edited by Roy P. Basler, Volume V, "Letter to Horace Greeley" (August 22, 1862), p. 388. "Common looking people are the best in the world: that is the reason the Lord makes so many of them." Lincoln and the Civil War In the Diaries and Letters of John Hay selected by Tyler Dennett (New York, Da Capo Press, 1988), p. 143. "I have been driven many times upon my knees by the overwhelming conviction that I had nowhere else to go. My own wisdom and that of all about me seemed insufficient for that day." Lincoln Observed: The Civil War Dispatches of Noah Brooks edited by Michael Burlingame (Baltimore, Johns Hopkins University Press, 1998), p. 210. "Labor is prior to, and independent of, capital. Capital is only the fruit of labor, and could never have existed if labor had not first existed. Labor is the superior of capital, and deserves much the higher consideration." Lincoln's First Annual Message to Congress, December 3, 1861. "Beavers build houses; but they build them in nowise differently, or better now, than they did, five thousand years ago. Ants, and honey-bees, provide food for winter; but just in the same way they did, when Solomon referred the sluggard to them as patterns of prudence. Man is not the only animal who labors; but he is the only one who improves his workmanship." The Collected Works of Abraham Lincoln edited by Roy P. Basler, Volume II, "First Lecture on Discoveries and Inventions" (April 6, 1858), p. 437. "Adhere to your purpose and you will soon feel as well as you ever did. On the contrary, if you falter, and give up, you will lose the power of keeping any resolution, and will regret it all your life." The Collected Works of Abraham Lincoln edited by Roy P. Basler, Volume V, "Letter to Quintin Campbell" (June 28, 1862), p. 288. "I cannot make it better known than it already is that I strongly favor colonization." 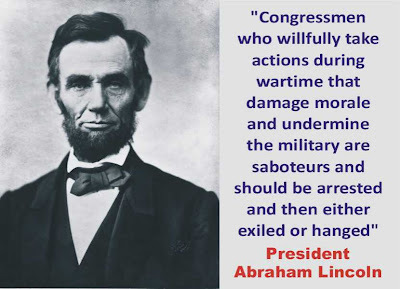 Lincoln's Second Annual Message to Congress, December 1, 1862. "I claim not to have controlled events, but confess plainly that events have controlled me." The Collected Works of Abraham Lincoln edited by Roy P. Basler, Volume VII, "Letter to Albert G. Hodges" (April 4, 1864), p. 281. "...I know that the Lord is always on the side of the right. But it is my constant anxiety and prayer that I and this nation should be on the Lord's side." The Inner Life of Abraham Lincoln: Six Months at the White House by Francis B. Carpenter (Lincoln, Nebraska, University of Nebraska Press, 1995), p. 282. Also, Recollections of Abraham Lincoln by Ward Hill Lamon (Lincoln, Nebraska, University of Nebraska Press, 1994), p. 91. "In giving freedom to the slave, we assure freedom to the free - honorable alike in what we give, and what we preserve. We shall nobly save, or meanly lose, the last best hope of earth. Other means may succeed; this could not fail. The way is plain, peaceful, generous, just - a way which, if followed, the world will forever applaud, and God must forever bless." Lincoln's Second Annual Message to Congress, December 1, 1862. "With malice toward none, with charity for all, with firmness in the right as God gives us to see the right, let us strive on to finish the work we are in; to bind up the nation's wounds; to care for him who shall have borne the battle, and for his widow and his orphan - to do all which may achieve and cherish a just and lasting peace, among ourselves, and with all nations." Lincoln's Second Inaugural Address, March 4, 1865. "At what point shall we expect the approach of danger? By what means shall we fortify against it? Shall we expect some transatlantic military giant, to step the Ocean, and crush us at a blow? Never! All the armies of Europe, Asia and Africa combined, with all the treasure of the earth (our own excepted) in their military chest; with a Buonaparte for a commander, could not by force, take a drink from the Ohio, or make a track on the Blue Ridge, in a trial of a thousand years. At what point, then, is the approach of danger to be expected? I answer, if it ever reach us it must spring up amongst us. It cannot come from abroad. If destruction be our lot, we must ourselves be its author and finisher. As a nation of freemen, we must live through all time, or die by suicide. The Collected Works of Abraham Lincoln edited by Roy P. Basler, Volume I, "Address Before the Young Men's Lyceum of Springfield, Illinois (January 27, 1838), p. 109. "I do therefore invite my fellow citizens in every part of the United States, and also those who are at sea and those who are sojourning in foreign lands, to set apart and observe the last Thursday of November next, as a day of Thanksgiving and Praise to our beneficent Father who dwelleth in the Heavens. And I recommend to them that while offering up the ascriptions justly due to Him for such singular deliverances and blessings, they do also, with humble penitence for our national perverseness and disobedience, commend to His tender care all those who have become widows, orphans, mourners or sufferers in the lamentable civil strife in which we are unavoidably engaged, and fervently implore the interposition of the Almighty Hand to heal the wounds of the nation and to restore it as soon as may be consistent with the Divine purposes to the full enjoyment of peace, harmony, tranquillity and Union." The Collected Works of Abraham Lincoln edited by Roy P. Basler, Volume VI, "Proclamation of Thanksgiving" (October 3, 1863), p. 497. "I have been shown in the files of the War Department a statement of the Adjutant General of Massachusetts, that you are the mother of five sons who have died gloriously on the field of battle. I feel how weak and fruitless must be any words of mine which should attempt to beguile you from the grief of a loss so overwhelming. But I cannot refrain from tendering to you the consolation that may be found in the thanks of the Republic they died to save. I pray that our Heavenly Father may assuage the anguish of your bereavement, and leave you only the cherished memory of the loved and lost, and the solemn pride that must be yours, to have laid so costly a sacrifice upon the altar of Freedom." The Collected Works of Abraham Lincoln edited by Roy P. Basler, Volume VIII, "Letter to Mrs. Lydia Bixby" (November 21, 1864), pp. 116-117. "It is said an Eastern monarch once charged his wise men to invent him a sentence to be ever in view, and which should be true and appropriate in all times and situations. They presented him the words: 'And this, too, shall pass away.' How much it expresses! How chastening in the hour of pride! How consoling in the depths of affliction!" The Collected Works of Abraham Lincoln edited by Roy P. Basler, Volume III, "Address Before the Wisconsin State Agricultural Society, Milwaukee, Wisconsin" (September 30, 1859), pp. 481-482. "If all do not join now to save the good old ship of the Union this voyage nobody will have a chance to pilot her on another voyage." The Collected Works of Abraham Lincoln edited by Roy P. Basler, Volume IV, "Speech at Cleveland, Ohio" (February 15, 1861), p. 216. "Neither party expected for the war, the magnitude, or the duration, which it has already attained. Neither anticipated that the cause of the conflict might cease with, or even before, the conflict itself should cease. Each looked for an easier triumph, and a result less fundamental and astounding. Both read the same Bible, and pray to the same God; and each invokes His aid against the other. It may seem strange that any men should dare to ask a just God's assistance in wringing their bread from the sweat of other men's faces; but let us judge not, that we be not judged. The prayers of both could not be answered; that of neither has been answered fully. The Almighty has His own purposes." Lincoln's Second Inaugural Address, March 4, 1865. "I am not a Know-Nothing. That is certain. How could I be? How can any one who abhors the oppression of negroes, be in favor of degrading classes of white people? Our progress in degeneracy appears to me to be pretty rapid. As a nation, we began by declaring that "all men are created equal." We now practically read it "all men are created equal, except Negroes." When the Know-Nothings get control, it will read "all men are created equal, except Negroes and foreigners and Catholics." When it comes to this, I shall prefer emigrating to some country where they make no pretense of loving liberty - to Russia, for instance, where despotism can be taken pure and without the base alloy of hypocrisy." The Collected Works of Abraham Lincoln edited by Roy P. Basler, Volume II, "Letter to Joshua F. Speed" (August 24, 1855), p. 323. "Stand with anybody that stands RIGHT. Stand with him while he is right and PART with him when he goes wrong." The Collected Works of Abraham Lincoln edited by Roy P. Basler, Volume II, "Speech at Peoria, Illinois" (October 16, 1854), p. 273. "To state the question more directly, are all the laws, but one, to go unexecuted, and the government itself go to pieces, lest that one be violated? Even in such a case, would not the official oath be broken, if the government should be overthrown, when it was believed that disregarding the single law, would tend to preserve it? But it was not believed that this question was presented. It was not believed that any law was violated. The provision of the Constitution that 'The privilege of the writ of habeas corpus, shall not be suspended unless when, in cases of rebellion or invasion, the public safety may require it,' is equivalent to a provision---is a provision---that such privilege may be suspended when, in cases of rebellion, or invasion, the public safety does require it. It was decided that we have a case of rebellion, and that the public safety does require the qualified suspension of the privilege of the writ which was authorized to be made." Lincoln's Message to Congress in Special Session, July 4, 1861. "There are no accidents in my philosophy. Every effect must have its cause. The past is the cause of the present, and the present will be the cause of the future. All these are links in the endless chain stretching from the finite to the infinite." Herndon's Life of Lincoln by William H. Herndon and Jesse W. Weik (New York, Da Capo Press, 1983), p. 354. "The legitimate object of government is 'to do for the people what needs to be done, but which they can not, by individual effort, do at all, or do so well, for themselves'." The Collected Works of Abraham Lincoln edited by Roy P. Basler, Volume II, "Fragment on Government" (July 1, 1854? ), p. 221. For questions or suggestions about Abraham Lincoln's quotes or would simply like to include another quote from Lincoln, please feel free to contact us.